It was really nice to be included in watching the games. I was the oldest grandchild and eventually became too old to be part of the “kids table” and was still way too young to sit with the adults. Because I was included, I really began to like baseball and started learning a little bit about sports. My uncle was a Mets fan and I remember when they won the series in 1969. It was as if they were doing it for us! And then the year I got married they won the series again. It was hard not to think that there was a special coincidence there. And the best moment of all with my uncle? I’d have to say it was at my wedding. I was dancing with my husband and my Uncle Tom asked to cut in. And for a moment I was dancing with Uncle Tom. And then both of his brothers – Bill and Richard cut in as well and for what was probably only a minute I got to dance with my Mother’s three brothers. It was such a special treat for me to be dancing with them all! About ten years ago, my family got to go to Walt Disney World because my Uncle Billy was working there and was able to get us in for free. It was such a tremendous gift to us. When we arrived at his house I presented my uncle with a baseball that had been autographed by Harmon Killebrew. It just so happened that Mr. Killebrew had appeared at a regional game and willingly signed autographs for the fans. I asked him to sign a ball for my uncle because he is the biggest baseball fan that I know. And it was so cool to be able to give him a baseball that was signed by a man who was in the Baseball Hall of Fame. 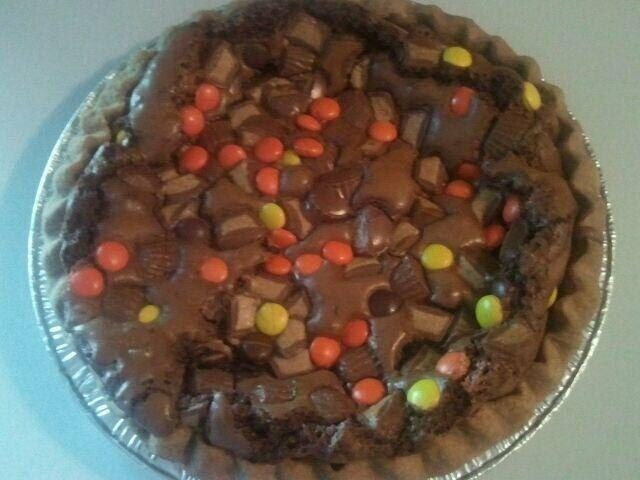 Because I planned ahead, my Uncle Billy received his “brownie pie” today (I mailed it Monday). I wanted to make sure that he knew that I am very grateful for all he has done for me. And I want to thank his wife, Aunt Carol, for making me feel so special. They have both done so much for my family and we are all very thankful.